There are plenty of reasons to be watching as Narendra Modi arrives in Washington on Tuesday. The Indian prime minister has made waves as a jet-setting world leader since taking office two years ago; despite a controversial past that once led to his banishment from the United States, this is in fact his second state visit to Washington in that short time. His visit will probably focus on trade issues, though there are other notable angles to the trip, including security and climate-change policy. Modi has become well-known for his vigorous hugs and handshakes with other world leaders, displaying a tactile familiarity that often seems to take his counterparts by surprise. The resulting pictures can often be awkward, subsequently making headlines all over the world. The tone can veer from admiration to mocking and everything in between. One notable recent example came when Prince William visited India. While Modi went to shake his guest’s hand, the imprint Modi made on the British royal’s hand seemed to suggest a vice-like grip. Social media users didn’t fail to notice this or the slightly pained expression on William’s face after the shake. “This Picture Of Prince Will’s Hand Was Taken After He Shook Hands With Modi, And It’s Crazy,” ran the BuzzFeed headline — which also noted some other handshakes that may have been slightly painful. Meanwhile, CNN posted a GIF of the encounter that showed the full squeeze. But handshakes are not Modi’s favored greeting. Instead, the prime minister is probably better known for his hugs. Modi’s full-body embraces have become a feature of his meetings with both high-level global leaders and more humble local politicians, as you can see in the images below. For all of the goodwill that these embraces appear to show, they can create somewhat surprising controversies. 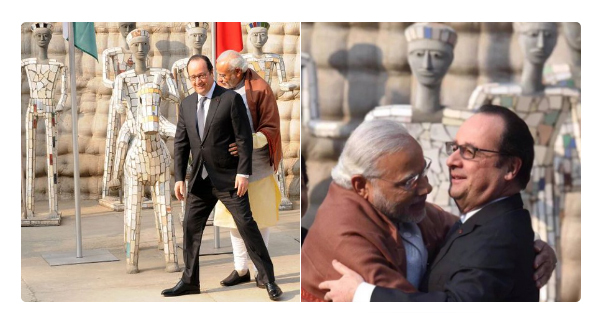 In January, as he welcomed French President François Hollande to India, Modi appeared to move the European leader out of the way by placing his hands on his hips. In photographs of the act, it looked like a remarkably awkward hug from behind. On social media, some Indians wondered whether this was really a diplomatic way for two world leaders to meet. But perhaps the most telling moment came in 2015, when Modi appeared to pull Facebook’s Mark Zuckerberg back so he wouldn’t block the view of photographers during a trip to the social network’s Silicon Valley headquarters. That also fits into a broader criticism of Modi — that he cares far too deeply about his image. Since taking office in 2014, he has become renowned for his love of selfies. His sense of style is equally famous: He wore a suit with his name embroidered on it a thousand times when President Obama visited India two years ago, and he is known for having a large collection of hats. Some have wondered whether Modi’s stilted physicality is a conscious move. After all, while being accused of being an awkward hugger who loves fashion and taking selfies may perhaps be embarrassing, it’s certainly better than another criticism frequently leveled at him: that his Hindu nationalism is really anti-Muslim extremism in disguise. Hugging world leaders also puts India, an enormous country that has struggled with legacies of colonialism, on an equal footing with Western leaders.